Come and stay at Katerina's, ideally placed right next to the village centre of Rothbury. Cath & Ian have lived/worked in this quaint property for over 30 years, first operating a popular, Egon Ronay-recommended restaurant and now a charming guesthouse. We have modernised the building sensitively, preserving its charm and beautiful olde worlde character with fully en suite, four poster bedrooms and tasteful décor, bringing past and present together with pleasing results. Rooms are well equipped with bedside lights, TVs, fridge, cosy, variable central heating, hairdryer etc. We provide bathroom toiletries and ... every day ... you'll find fresh milk and scrumptious tea-time treats waiting for you when you come back from a hard day's sight seeing! In the morning, choose from our wide range of breakfast items, prepared when you order - not beforehand. Smell the homemade bread as you come down to breakfast and try our aromatic Whisky Porridge! Additionally, we also offer evening meals by arrangement - including several of our recipes from the Egon Ronay days. The evening menu is therefore similarly wide ranging and also lovingly cooked to order and we have a full alcohol license for accompaniments. The basic tariff of £82 - £85 per double room (reduced rates start for 2 or more nights stay) includes breakfast and tea-time treats. Evening dinner incurs an extra charge - variable depending on your choice of food. Prices are to be found on our web site. Rothbury and Northumberland National Park are ideal for all types of holidays; enjoy walking, golf, fishing, horse-riding or just relax! The locals are very friendly and the village has a good selection of shops, tea-rooms and pubs. It is also the perfect centre for touring, having stately homes, castles, magnificent views, a beautiful coastline and the Scottish Border Country all within an hour's drive. Even Edinburgh takes less than 2 hours! Rothbury is just 6 miles off the main A697 route from Newcastle to Edinburgh and we are easily found close to the top of the High Street with ample on-street parking right outside. 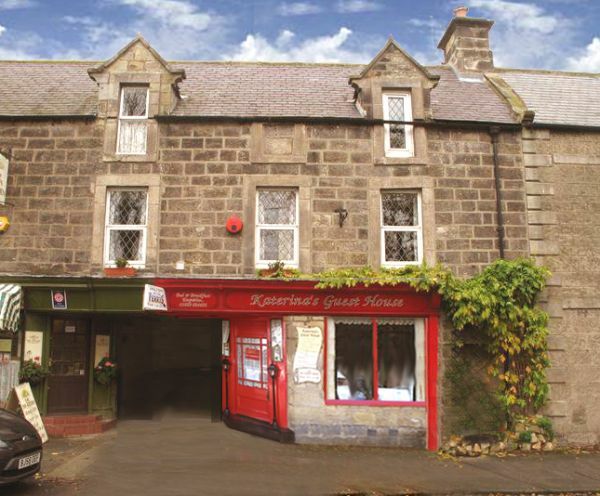 Katerina's is situated on High Street in central Rothbury, a village in rural Northumberland, known for outdoor pursuits, particularly hill walking. High Street is literally named; the length of the flagstone path slopes up and down hill and the road slopes sharply down to the adjoining main road. Katerina's occupies a quaint and characterful building at least 320 years old. It was part of a coaching inn and therefore has some delightful features of historical interest. Aged constructions do not easily lend themselves to the level of comfort we require in this day and age and it has been modernised with thought and care in an effort to preserve its uniqueness whilst rendering the building eminently useable, comfortable and attractive. We want everyone who comes to Katerina's Guest House to enjoy their stay and feel at home. With that in mind we encourage would-be Guests to discuss their individual requirements with us. We are versatile and will do our utmost to accommodate all your needs. • There is a bus stop opposite 275mtrs away on the lower, main road. The bus service is limited. • The main train station is 30 minutes away by car. • There is a taxi service, 24 kms away in Morpeth that has accessible taxis if required. We can make a booking for you. • Brochures and menus are available in large print. • We have a basic web site. • We recommend you contact us by phone to discuss any special requirements. (see Contact Information below). • Katerina's has no private car parking. • Immediately outside, High Street has been widened and there are usually spaces close by. There are no charges and no time limits on parking outside. • High Street is a sloping path of fairly flat flagstones. The Guest house entrance is accessed via a short, covered lane, ramped at the entrance and surfaced with rutted concrete. • There is a door bell and the telephone number is clearly displayed on a board outside. • Rothbury village amenities are all within a few minutes walk. • The front door is 82cms wide and has a low step only 4cms high. Inside there is a small lobby of 80cms x 95 cms and an internal door 76cms wide. • This in turn leads to a short length of passage 1mtr x 95cms and immediately ahead is the staircase to the first floor. • There is a fire door (76 cms wide) to the right of this passage leading to the guests' dining room. • The whole of the ground floor is carpeted with the exception of the kitchen which is not normally accessed by guests. • The dining room is the only public area on the ground floor. • The first floor is totally devoted to three guest bedrooms. There are no other public areas. • Upstairs is accessed by a straight flight of10 stairs (16cms high, 24cms deep and 87cms wide) with a handrail, followed by three which turn to the left (these are 63cms at the widest, right hand side and 4cms at the narrowest, left hand side). • At the top, the handrail is replaced by a vertical grab rail. • The upstairs passage turns immediately to the left and access to the first bedroom is on the right. • The 88cms wide passage runs straight for 3 mtrs and then turns left again. Here the floor slopes down and another small passage (90cms x 1mtr 80cms) joins in an "L" shape. • Straight ahead is the door to bedroom 3 whilst 2 is at the right end of the small passage. • The staircase and passages are carpeted with short pile carpet. Light switches are illuminated for easy finding. A light at the top of the staircase stays on permanently. • There are linked mains operated smoke alarms with battery back-up in the passage and this is the exit route in the event of a fire. • The whole Guest House is entirely non-smoking. • Breakfast and dinner are served in the dining room on the ground floor. This room is carpeted. • There is another linked mains operated smoke alarm with battery back-up in the dining room. • Lighting is by three ceiling chandeliers, a standard lamp, two further lamps as well as one lamp on each dining table. • At breakfast, a varied menu is provided for Guests to choose from. Cooked breakfast is served at the table and there is a self service cereal bar. The owners are present throughout to attend the Guests. • At dinner, a varied menu is provided for Guests to choose from though some advance notice is required to allow time for appropriate shopping for fresh ingredients. The owners are present throughout to attend the Guests. • We are able to cater for special diets on request. • There are three "Refectory" style dining tables 974cms high x 1mtr 20 cms long x 69cms wide and an underspace of 70cms) with two armless dining chairs at each. The tables are varnished, rich, brown wood and contrast well with our light coloured crockery. • Menus are offered showing prices according to choice. A large print menu is available. • Some facilities may be available - please ask. An ironing and ironing board are available for guest use - please ask. • All 3 bedrooms are on the first floor. Sloping floors of over 300 years old mean that some furniture has had to be fixed to the walls for stability. • All bedrooms have fire doors with automatic closers - 76cms wide. • All three beds are double, wooden four posters (height to top of mattress is 48cms in each case). These beds are able to be moved if necessary. • Modern feather-free bedding (pillows and duvets) is provided and thoroughly laundered between guests or every three/four days for longer staying guests. • All mattresses and pillows have removeable protectors which can be laundered. • Smoking and bringing pets is not allowed at Katerina's - there are no animals living on the property. • Each room is decorated with colour contrast in mind, light walls and relatively dark furniture ensure shelves etc. stand out. • Each room has TV with remote control, tea tray with cordless electric kettle (see through indicator for water level) and small fridges. We provide fresh milk and tea-time treats. • All Guests of Katerina's are shown around their bedroom on arrival and made aware of the facilites within and how to use these. • Room 1 has short pile carpet and minimum free floor space of 60cms wide. • There is a characterful but unobtrusive fireplace, blocked against draughts and dust. • A small, two seater, wicker couch is situated at the foot of the bed and there is a dressing table area with an upright chair near the window. • Ceiling light, bedside lights and two further lamps are provided in strategic places. • There is an ensuite bathroom (see below for details). • Room 2 has a short pile carpet and a minimum floor space of 51cms around the foot of the bed. • The window has a low window sill/window seat and this end of the room is furnished with two wicker arm chairs and a dressing table with upright chair. • The room is lit with a ceiling light, bedside lights (wall fitments with flexible arm) and a further lamp on the dressing table. • There is an ensuite shower room. • Room 3 has a short pile carpet and minimum floor space of 54cms. • There is a chunky, characterful fireplace, blocked against draughts and dust. • There are two wicker arm chairs and the window has a low window sill/window seat. • A dressing table, unusually low (56cms), due to the situation of a quaint, little internal window and part of a range of built-in wardrobes has a low stool (38cms) to accompany it. • The room is lit by two double wall lights, bedside lamps (wall fitments with flexible arm) and a further lamp on the dressing table. 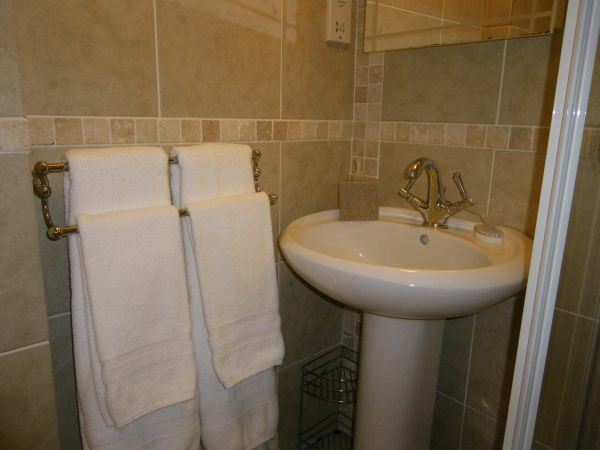 • There is an en suite shower room. • Room 1 – en suite bathroom with over-bath shower. • A small corridor (98cms wide x 1mtr 50cms long) turns right and leads from the bedroom to the bathroom. • The door to the bathroom, hinged on the left, opens outwards and is 76cms wide. 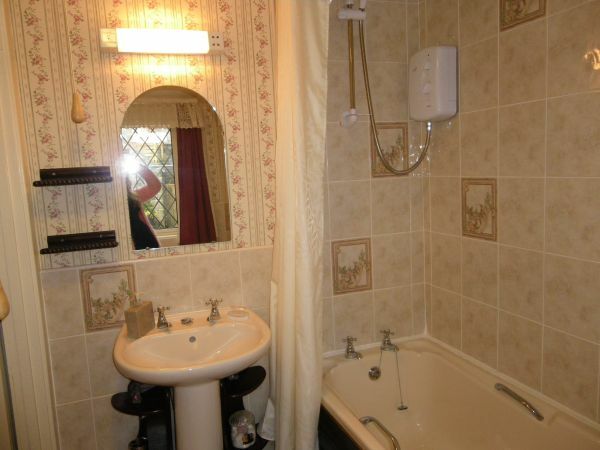 • Ahead is 1mtr 5cms of floor space to the side of the bath which is 54cms high. • The bath has integral handles on each side to assist getting in/out. • The taps are normal cross head style and there is an electrically heated shower over the bath. • The flooring is of tiles with a rough, non-slip surface. • The wash basin is to the left, round fronted and is 79cms high. • The toilet, situated at the end of the bath, is 39 cms high with a space of 15cms to the right and a space of 19cms to the left. 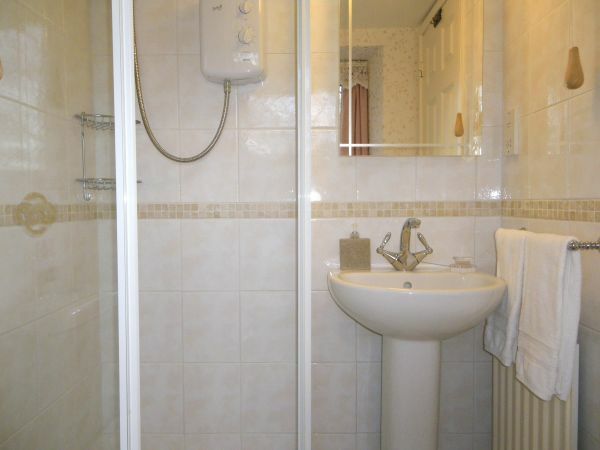 • Room 2 – en suite shower room. • The door (67cms wide) to this compact shower room (measuring 2mtrs 33cms x 2mtrs 50cms in total) opens in to the bathroom directly from the bedroom, near the foot of the bed. • There is a glass enclosed shower. The shower tray measures 76cms x 76cms. • The remaining floor space is 1mtr 30cms x 80cms. • The toilet is 41cms high with a space of 14cms to the right and 15cms to the left. • The washbasin has a lever mixer-tap and is 81cms high. • The shower is electrically heated. • Room 3 – en suite shower room. • The door (54cms) is hinged on the left and opens into the shower room directly from the bedroom. • This floor is tiled with slightly glossier tiles though, in experience no slippier. • There is a large window with low window sill and it is necessary to close the curtains for privacy. • The remaining L shaped floor space is 1mtr 12cms x 70cms. • The toilet is 41cms high with a space of 16cms to the left and 10cms to the right though it appears bigger as the space goes on into the depth of the window seat. • The washbasin has a lever mixer-tap and is 83cms high. • In case of fire, the fire alarm will ring. • In case of emergency and the need to evacuate the building, the exit route is down the staircase ..described above and out of the front door. • If you require more assistance for evacuating please notify us on arrival and we will ensure you are ..evacuated safely e.g. hearing impairment as mentioned above. • Katerina's is a no smoking building (there is a covered alleyway outside where you may smoke). • We supply a small fridge in the bedrooms. Medicines requiring low temperatures should keep safely within. • We are always here to help, please ask us about anything, we'll do our best to answer or explain. • Emergency number: If we are out, we use call divert to our mobile so we are accessible at all times. Rothbury is easily accessed by car. From the south, turn off the A1 onto the A697 just north of Morpeth, then turn left onto the B6344 after 8 miles. After a further 5 miles, turn left again at the T junction with the B6341, which is just outside the village. From the north, travel south down the A68 from Edinburgh, then turn left onto the A697 at Carfraemill (just north of Lauder). The road goes through miles of pleasant and quiet countryside passing Coldstream, Cornhill, Wooler, Millfield and Powburn. A few miles past Powburn, you will see a turning to the right, the B6341 to Rothbury. 4 miles over this spectacular moorland road takes you to the village. Some travellers coming from the west may prefer to drive over the A69 from the M6 at Carlisle, turning left at Greenhead onto the B6318.This goes right along the line of Hadrian’s Wall to Chollerford. Just beyond Chollerford, take the left turning to get to Rothbury (via the B6342), only about 45 minutes’ drive away. In spite of its isolated situation, Rothbury also has a half-decent bus service (during daylight hours at least), via the X14 which runs more or less hourly from Newcastle via Morpeth, turning around at Thropton, two miles beyond Rothbury. This service can be subject to change and is, in any case, much reduced at weekends, so it is always advisable to check with the Arriva timetable before commencing the journey in either direction. There is safe, unrestricted, free parking just outside our house. As required. Please let me know your needs. Yes, we have a PDQ machine. Flat screen remote, multi-channel TVs are provided in each bedroom. All our rooms have four poster beds. They are open top with no canopy and dressed in light lacy fabrics. There's a hairdryer in each bedroom. We provide a wide range of teas/coffees to choose from - and we also give you tea time treats every day! If you need something laundered, please ask. We have a tucked away corner in the yard behind us. Safe but no shelter unfortunately. Free wifi provided in all areas. The password is available in your bedroom. Our 6-night stay at Katerina's was first rate. 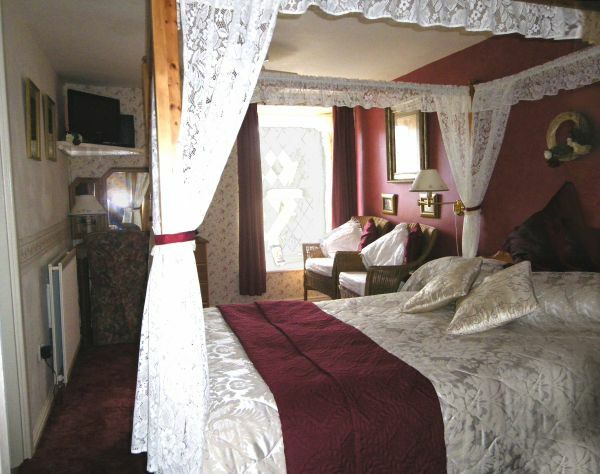 Lovely room with four-poster bed, every comfort, delicious breakfasts and dinner, above all the most hospitable owners. Cath and Ian made us feel as if we were old friends. 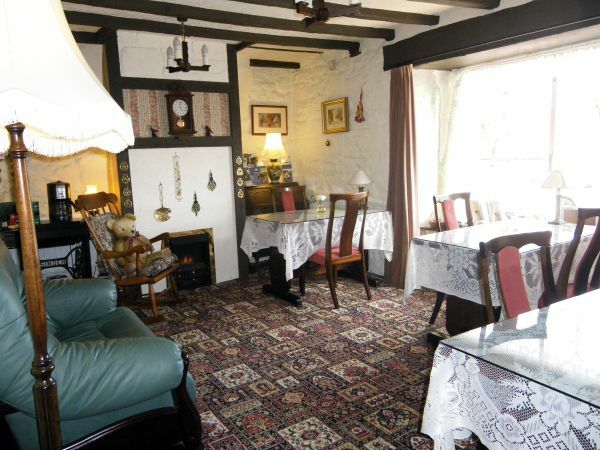 The house is a gem, about 300 years old, and furnished in a very homely style. Rothbury is a great place to stay, an unspoiled large village with a choice of good places to eat within walking distance of Katerina's. Lovely views of hills from the guest house, and good walking routes all around. Stayed for one night at Katerinas bed and breakfast, very pleasant, nice if not quant room, clean and comfortable, made to feel very welcome on our arrival, fresh milk for drinks...always welcome, ! ! Great breakfast, and not pressured on to es to leave, which was great. Would recommend to stay here again. 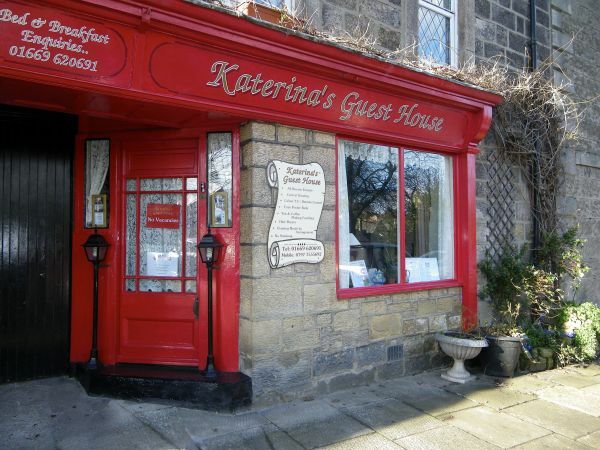 Katerinas Guest House, Rothbury, Northumberland. We would like to thank Kath & Ian for our two day break at their lovely guest house in Rothbury. The accommodation and food selection are excellent and Kath & Ian are the nicest and friendliest people you could meet. We look forward to our next visit. Dorothy & Barry. 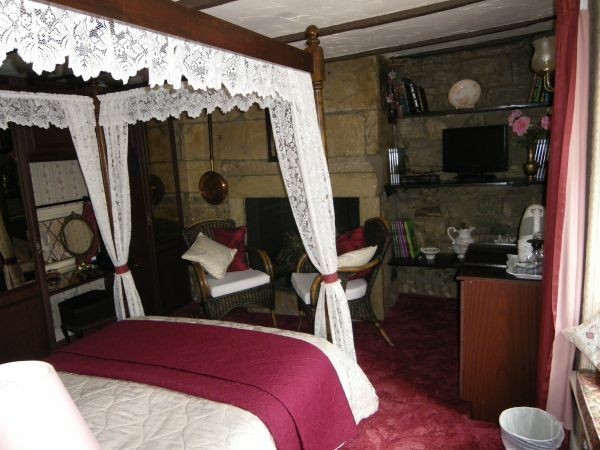 Beautiful little B&B right in the centre of Rothbury. 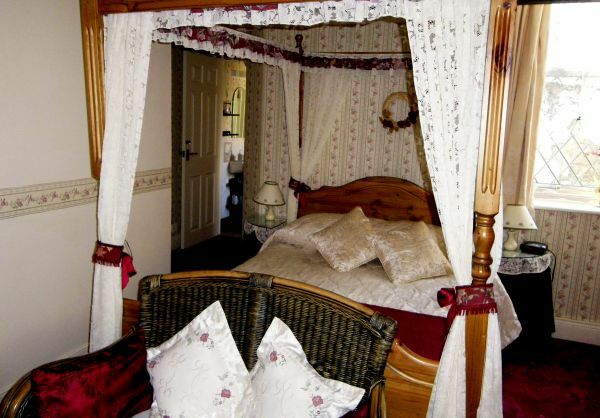 Lovely room with four poster bed, excellent breakfast. 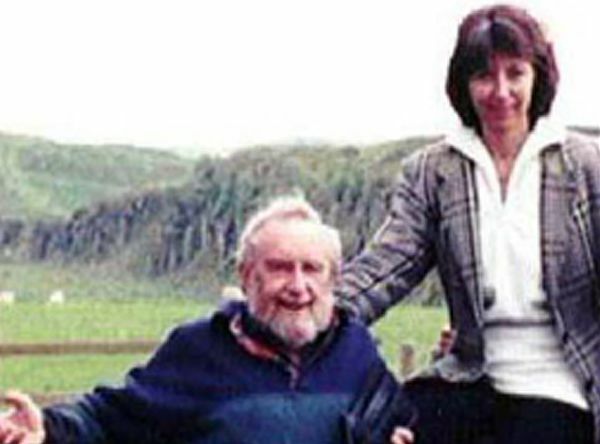 Best of all Cath and Ian, who made us feel more like visiting friends than paying guests. Would totally recommend especially for couples.